Norwich go up to eighth in the table, Bournemouth are 15th. Thanks for joining me today for an entertaining game. Don't forget to check out the goals on Match of the Day tonight. Keep across the reaction to this and every other game on our live text commentary. Or read my developing match report here. Bournemouth keeper Artur Boruc saves from Robbie Brady at the near post. Almost over. Four minutes of this procession to Norwich's victory added on. Bournemouth's Yann Kermorgant is hurt after a challenge from fellow substitute Martin Olsson. The Frenchman loses his boot too but he finds it again and is OK to continue. Steve Cook's goal didn't start any kind of Bournemouth comeback - Norwich are going to win this. Dieumerci Mbokani has a chance to put this game out of sight on his Norwich debut as he stretches to turn home a Nathan Redmond cross but he failed to make sufficient contact and couldn't turn home the rebound either. Norwich have now brought off all three goalscorers as Cameron Jerome is replaced by striekr Dieumerci Mbokani for his debut. Are Bournemouth back in this game? Steve Cook heads home a Simon Francis corner from the edge of the box. Ten minutes left to score twice. This game has died a death to some extent, with Norwich having definitely picked up the three points. But they fancy a fourth but Cameron Jerome's pass to Nathan Redmond is intercepted on the edge of the box by a Cherries player. Norwich bring off Wes Hoolahan, the game's outstanding player, and he's replaced by Graham Dorrans. Debutant Matt Jarvis, another goalscorer, comes off for Martin Olsson. Guy, London: Norwich v Bournemouth is possibly the most garish football match I've ever seen. It's hurting my eyes. It's bright yellow and green v bright pink. Like a match full of highlighters. Bournemouth make their final change as Dan Gosling replaces Eunan O'Kane in midfield. Eddie Howe knows this game is done. Well actually Paul (see last entry), this game is over now. Matt Jarvis marks his Norwich debut with a goal. Jonathan Howson plays the ball forward to the winger, who gets the ball on his left foot and curls home. The worst thing a manager can hear is when the home crowd is starting to give the oles. The job isn't over yet - this game isn't over. Norwich should be out of sight by now as Robbie Brady finds space in the box and tries to beat keeper Artur Boruc at his near-post but sees his effort smash off the post. That would have been his first goal for this new club. Simon Francis almost scores an own goal as he skews a poor Norwich shot over the bar. Hard to see Bournemouth getting back into this. Here you can see how Wes Hoolahan scored his goal. Eunan O'Kane lost the ball near the halfway line and Hoolahan did the rest. Robbie Brady takes a free-kick from deep that goes past everyone and goes just wide - Bournemouth keeper Artur Boruc seemed to be worried there. Bournemouth midfielder Matt Ritchie is booked for clipping the hell of Nathan Redmond as he was speeding away. It's the Wes Hoolahan show, he's been at the heart of everything for Norwich. On this occasion however as the ball breaks to him outside the box, Steve Cook does enough to deny the attacking midfielder. Bournemouth make a double change in their attacking ranks as Glenn Murray comes on for a debut, and Yann Kermorgant is also introduced. Joshua King and Junior Stanislas are the men to make way. It's all Norwich now. Andre Wisdom puts in a cross from the right-hand side and Cameron Jerome's close-range effort is scrambled wide. Almost 3-0. Simon Francis on the brink here, the Bournemouth right-back was booked in the first half and brings down winger Matt Jarvis. I think he'd have been shown a yellow card for that normally. Wes Hoolahan didn't need Cameron Jerome that time! The Irish wizard gets the ball 40 yards out and runs towards goal. He has a couple of options in the box - including Jerome - but this time he fancies having a go himself and fires home from 20 yards out. Wes Hoolahan comes forward and lays the ball off to Cameron Jerome but the Norwich striker's shot from just outside the box is wide. Those two have linked up brilliantly today - there's been three or four chances including the goal. Bournemouth have the first shot of the second half as Simon Francis finds Junior Stanislas but the 25-year-old gets his shot wrong from 16 yards out and it's well wide. Both sets of players are back out on the pitch, doesn't look like either side are making a change at half-time. Matt, London: Crazy to think Wes Hoolahan is now pulling the strings against teams in the Premier League. I remember him playing in a struggling Blackpool side not too long ago. I once saw Hoolahan named man of the man in a Champions League qualifier back in 2004 for Shelbourne v Deportivo La Coruna. It's a major shame for him that his career seemed so slow to really get going at the top level. He's 33 now! The only shot on target in the whole half was the goal. Norwich have edged the stats so far. There is no graphic to show when a player has his shinpad in his hand like Wes Hoolahan did when he set up Norwich's goal but here is how the Canaries worked the ball from the back before Hoolahan beat Cherries defender Steve Cook and crossed for Cameron Jerome to break the deadlock. I think Norwich just about edged that half with Wes Hoolahan creating a couple of chances for Cameron Jerome. When he created that moment of brilliance for the goal - he had three or four options and he picked the right one, that's what makes him a top-class player. Bournemouth defender Steve Cook heads the ball onto Callum Wilson, who hits the post from close range under extreme pressure from Cameron Jerome. It looks like keeper John Ruddy might have actually touched that onto the woodwork, crucial save. Two minutes added on, mostly for Alexander Tettey's early injury. Eunan O'Kane finds Andrew Surman down the left-hand side for Bournemouth but his cross is nowhere near Callum Wilson and keeper John Ruddy holds onto it. Bournemouth boss Eddie Howe will be happy to see the break as Norwich are attacking again. The Canaries have been the better side so far. Callum Wilson comes forward for Bournemouth, he nutmegs Sebastien Bassong but can't get into a shooting position - he attempts to find a team-mate but his pass is poor and the momentum of the move is gone. Five minutes until the break and Norwich are looking fairly comfortable. They're just playing the ball around at the back. In-form Callum Wilson hasn't gotten many sniffs in front of goal for Bournemouth. "Wes Hoolahan is so important for Norwich - he makes them tick and makes things happen. And good play by Cameron Jerome, attacking the ball and scoring the goal." Is this going to start a craze where everybody plays with their shinpads in their hands? The new snoods maybe. Norwich midfielder Wes Hoolahan is still holding his shinpad as he nutmegs defender Steve Cook and squares it forCameron Jerometo scramble home under pressure from eight yards out. Norwich midfielder Wes Hoolahan is running about with his shinpad in his hand. Somebody needs to tell that lad where you're meant to put it. While that's happening Matt Ritchie puts in a poor cross for Bournemouth and it's easily cleared. Norwich striker Cameron Jerome has the best chance of the game as Wes Hoolahan finds him with a clever through-ball - but the much-travelled frontman fires it into the side-netting from an angle. It's two yellow cards apiece now as Norwich midfielder Wes Hoolahan blocks a Simon Francis cross with his hands - although it looked like he was protecting his face. So a bit harsh. "You don't know what you're doing" chime the Canaries fans to referee Martin Atkinson. Norwich left-back Robbie Brady has saved his team with a brilliant tackle there. The ball is played forward to Callum Wilson and with the in-form striker set to pounce, the Irishman just about gets a leg in to get the ball out for a corner. Bournemouth winger Joshua King squanders a good chance - he's got the ball on the byeline but seems to almost lose concentration and controls it out of play. We're not going to end with 22 men on this pitch surely. I'd barely told you about Simon Francis's yellow before team-mate Adam Smith joined him in the booking club for an angry clash with Wes Hoolahan. Three players on a card already. It's the second yellow card of the game as Bournemouth defender Simon Francis brings down Matt Jarvis, who was just about to go on a dribble. Very much taking one for the team. Norwich defender Sebastien Bassong gets his foot onto a Bournemouth ball but it loops high in the air and into the hands of John Ruddy. A nervous moment there for the Cameroonian. Norwich midfielder Alexander Tettey is booked for a high tackle from behind on Joshua King, who was charging forward. King was the player who injured Tettey in the opening minutes. Slightly surprising all Norwich's stuff is coming through the right when they have Robbie Brady and Matt Jarvis both playing on the left. Brady is playing at left-back despite being a natural winger like Jarvis. Bournemouth attack well as Eunan O'Kane plays the ball out to right-back Simon Francis but his cross is easily held by goalkeeper John Ruddy. Neither side really on top in the opening 15 minutes, it's been fairly open. Matty Jarvis does what Matty Jarvis does best as the Norwich debutant winger goes on a surging run down the left-hand side but his cross is cleared away for a throw-in. A lot of pushing and shoving in the box but Joshua King eventually heads away Wes Hoolahan's corner. But Bournemouth can't clear their lines properly and Alexander Tettey absolutely lashes an effort over from 25 yards out. Norwich on the attack now, Wes Hoolahan ran the ball out of play a minute ago. And Sebastien Bassong chips a ball over the top but it's far too long for Cameron Jerome. But Norwich get the ball back and they have a corner now. Bournemouth midfielder Junior Stanislas wants to take a corner but referee Martin Atkinson is insistent it's not in the quadrant. He eventually positions it right but then Tommy Elphick concedes a free-kick straight away for fouling Sebastien Bassong once the kick is taken. Alexander Tettey comes back onto the pitch after some treatment, he's OK to continue. Alexander Tettey and Joshua King go up for a challenge, and Norwich midfielder Tettey is down injured. It was a clash of heads, perhaps with a bit of King's arm too. We are under way. Norwich in yellow and green, Bournemouth in a hideous pink kit. I've been informed the kit is for charity so I feel a bit bad now! 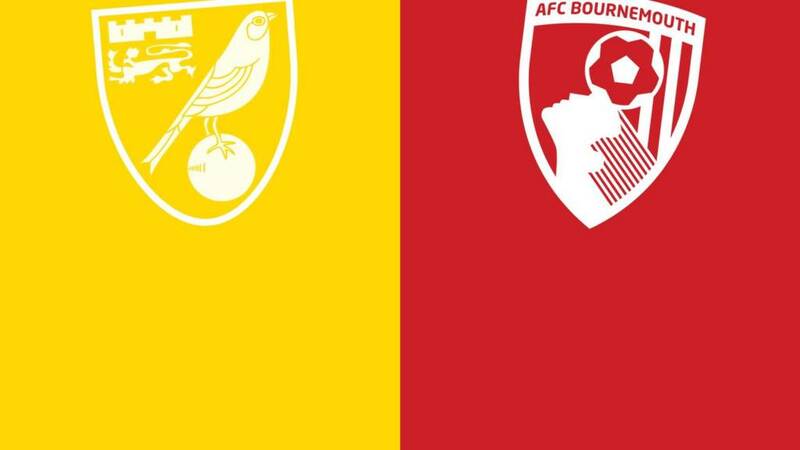 The players are on the pitch going through the various tedious pre-match pleasantries - it's almost time to go at Carrow Road, where there's a good atmosphere for the first ever Norwich v Bournemouth top-flight match. Bournemouth midfielder Eunan O'Kane was speaking to BBC Match of the Day commentator Conor McNamara before the game.Image caption: Bournemouth midfielder Eunan O'Kane was speaking to BBC Match of the Day commentator Conor McNamara before the game. Our record last year in front of goal was pretty good and we want to recreate it this year. Callum Wilson is quite a level-headed lad and has his feet on the ground. He's hungry for more goals and the spotlight. Hopefully you’ll be signing his praises after the game today. We're two teams that were in the same league last year and fought a really good battle to try and get out of the Championship, and both sides were successful. This game gives us a good marker, to see how much we've improved during the summer to now. Lewis Grabban could have been playing for either of these sides today - but now he won't be featuring at all. Bournemouth made three bids for the 27-year-old Canaries striker during the summer, all rejected. He has apologised after being fined and suspended following reports he walked out of their team hotel a couple of weeks ago. He broke the rules and paid the consequences. He is training to get his fitness back up. He wasn't at the club or training with any of the boys during the suspension. He must pay his dues until he works his way back into the squad. As far as I am concerned, the matter is pretty much done. I'd like to apologise to the club and most importantly the Norwich fans for my actions. I've served a suspension and been fined, which I fully accept. Now I'm just determined to train hard and to let my football do the talking - and to do everything I can to help Norwich City do well. "Callum Wilson is the Premier League's top-scoring Englishman this season, and Eddie Howe believes the additional firepower from new signing Glenn Murray can keep Bournemouth in the top flight. "Kyle Lafferty has scored seven goals in eight Euro 2016 qualifiers but has yet to feature for Norwich this season. "The Northern Irishman is keen to prove his worth in the Premier League and doesn't want another loan move: 'When I was a young boy I sat watching 'Match Of The Day' dreaming of playing there, so I'm not going to throw my towel in now.'" It is very early to be talking about six-pointers but this is a result that in six months' time could have a massive effect on where both clubs are at. Read more of Mark Lawrenson's and former F1 driver Mark Webber's predictions here. Norwich fans are 17th, Bournemouth supporters are in 13th. It's been a mixed start for followers of these two clubs when it comes to predicting the scores of top-flight matches so far this season, but there's plenty of time to change all that. Make your prediction for the outcome of this match and the rest of the weekend's Premier League fixtures here and help move your team up the leaderboard. You've still got time left - but hurry! Norwich hand a debut to Matt Jarvis, but fellow new recruit Dieumerci Mbokani is on the bench. Kyle Lafferty, despite seven goals in eight Northern Ireland Euro 2016 qualifiers, is on the bench. Norwich: Ruddy, Wisdom, Martin, Bassong, Brady, Redmond, Howson, Tettey, Jarvis, Hoolahan, Jerome. Subs: Rudd, Mbokani, Dorrans, Lafferty, Olsson, R Bennett, O'Neil. Bournemouth have new signings Glenn Murray and Joe Bennett are on the bench. Tyrone Mings and Max Gradel are long-term absentees. Bournemouth: Boruc, Francis, Elphick, Cook, Smith, Ritchie, O'Kane, Surman, Stanislas, King, Wilson. Subs: Federici, Distin, Bennett, Gosling, Pugh, Murray, Kermorgant. Both these teams came up from the Championship last season. They have both got highly rated, talented young managers. And they've got identical records in the league this season, an away win, a home draw and two defeats. So how will the first ever top-flight meeting between these sides go? Let's find out.